What is a quadratus lumborum stretch and why is it an important part of my training routine? Commonly referred to as the QL, this muscle is important to treat for anyone suffering from back or knee pain. Continue reading to learn where this critically important muscle group is located, why it’s so important in daily life and athletic performance, the symptoms of a tight QL, and how a ql stretch and strengthening program will resolve it*. The quadratus lumborum  is a rectangular shaped muscle lying deep within the abdomen and is located on either side of the lumbar spine. 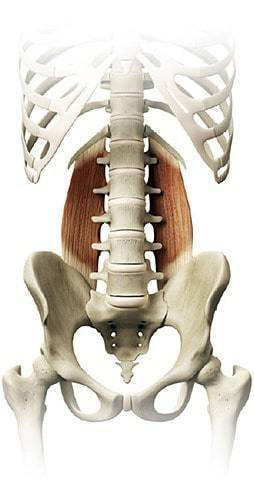 The QL is a deep lower back muscle that is underneath larger muscles and above the kidneys. Functionally, the QL contributes to both stabilization and movement of the spine and pelvis. Flexing the muscle on one side will bend the trunk in that direction, while flexing both sides will extend the spine. The QL is also fixed to the twelfth rib during rib cage movements and acts as an accessory muscle when you exhale. The quadratus lumborum functions as a team, working with the iliopsoas, lumbar paraspinals, and various ligaments, to stabilize the lumbar spine . So when you’re carrying a heavy bag in one hand your QL on the opposite side is firing hard to keep you straight. Throwing or kicking explosively requires the QL to flex hard to maintain torso position and stabilize the spine to transfer power throughout the body. Critically, the QL works with the gluteal muscles on the opposite side when we walk, so when those muscles are weak it can put excessive stress on the knee because the movement pattern becomes unstable causing the core and hips to lose stability. An effective quadratus lumborum stretch will help* undo this damage. A hiked hip, also known as lateral rotation on the affected side; is when one hip sits higher than the other functionally shortening the leg on the elevated side . This is a common symptom of a tight QL, which attaches at the top of the pelvis and pulls the hip closer to the ribcage. QL tightness shortens the waist on that side causing stress on the lumbar area and potentially causing severe back pain, and a dropping shoulder that will produce scapular problems. If one hip is noticeably higher than the other (and you don’t have a true leg discrepancy) or one shoulder is noticeably lower than the other, the odds are good that you’re suffering from a tight quadratus lumborum. Pain coming from the quadratus lumborum will be described as being anything from a deep low back ache to a knife like sensation. The techniques we’ll go through today could provide relief. The constant sideward stress of a tight quadratus lumborum creates a shearing motion in your lumbar and sacral vertebrae that can result in crippling back injuries. Knee pain (in this case patellar tendonitis) is a different kind of quadratus lumborum trouble. Instead of tightness, you likely have a weak QL muscle. If your right knee aches the cause can often be traced back to a strength imbalance between your left QL and your right glute. You can relieve that knee pain by strengthening your left QL muscle; luckily that’s part of the three step quadratus lumborum stretch program I’ll show you in a little while. What Causes the QL to Tighten Up? You can’t win when you’re dealing with a tight QL; inactivity and overuse can both cause a tight QL. The key issue is chronic forward flexion: whether you’re sitting still or riding a bike, maintaining forward flexion for long periods can create tight QL muscles . The back surgery I had when I was in high school left me with a contracted right side – the side where the scar is. Because of this, my right shoulder is lower than my left and before doing any exercise; I always lengthen the right QL to achieve symmetry, especially with any axial loading exercises like Squats or Deadlifts. This is just something I have to do before training and it won’t go away because it’s related to the huge scar I have from going under the knife that will never be as elastic as normal skin. Start by kneeling on the floor with the stability ball directly to one side. Now, lean over with your right arm to hold the stability ball and rest one side of your torso on the ball. Next, slowly straighten out your left leg (while still bending your other leg to maintain stability). To stretch the quadratus lumborum, slowly raise your arm up toward the ceiling. To increase the stretch, extend your arm over your head, in the opposite direction of your knees. Try holding the stretch for around 20 – 30 seconds and repeat two or three times for each side. First find a place to hold onto like a fence, pole or door frame. Now put your hands straight up in the air with straight elbows and bend to the side in the direction of whatever anchor point you’re using. Next you’ll move your outside foot behind you and toward the anchor point you’re holding. Slide your hands down as your body bends sideways into a comfortable stretch. Once you’ve reached your limit, relax into the stretch and hold it for 20 -30 seconds, while contracting the core muscles on the other side. Now, slowly ease back up. Just stretching the quadratus lumborum isn’t good enough; you have to strengthen the opposite side at its range of motion to notice a change in the balance of the two sides. Begin by lying on your side, your core muscles engaged, and your head resting on your bottom arm. Bring your bottom knee slightly towards the chest and rest it on the ground. Put your top knee in the air while keeping your foot on the ground and behind your bottom foot. Rotate your bottom leg while lifting your bottom knee towards the ceiling, keeping the top leg still and your feet on the ground. You need to train both left and right QL through their full range of motion to get the most benefit from my 3 step quadratus lumborum strength program. 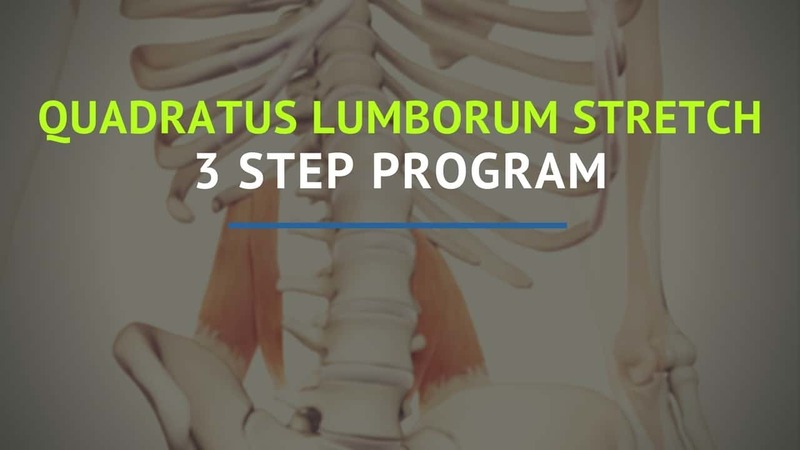 Use my 3 step quadratus lumborum stretch program to fix the pain that tight QLs are causing you and prevent the problem from recurring*. *Although the information shared on PrecisionMovement.coach is based on a well-researched, scientific approach towards health and fitness, every person is unique and individual results may vary. The information in this article is one more piece of information that will help you build and maintain a powerful core that will enhance your athletic ability while preventing injury.